Remembrance Day May be technically over for another year but I certainly couldn’t forget to mention the blazing memorial that I saw Friday, November 13, on the Cambie Street and 12th Avenue corner of Vancouver City Hall. 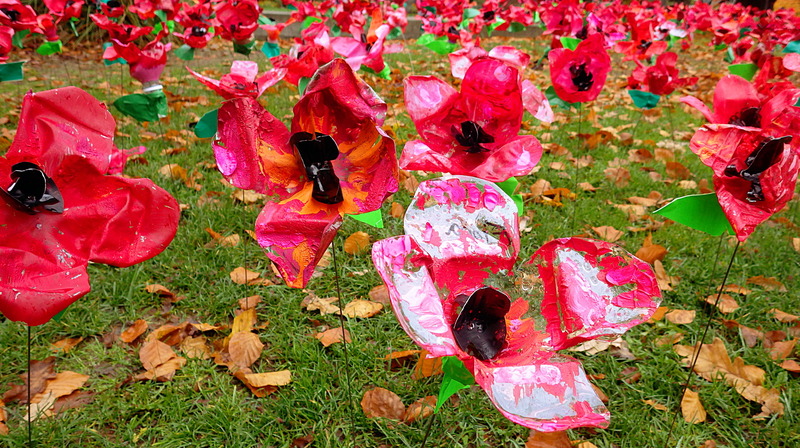 Planted on the southwest lawn of the City Hall grounds were a small field of some few hundred handmade poppies — each one with petals made from clear cellophane-like plastic and painted in brilliant hues from pink to rhodamine to fire engine red. Each had the same bit of black at its centre and each was utterly different from its neighbours. Every one sprouted a single green leaf marked on one side in black with the first name of the child who had made it. The little signs were one thing that I saw people stop to read but the field of poppies were a brilliant and arresting sight, more than capable of speaking for themselves, it seemed. Everyone that I saw come along, stopped at least for a moment, if not to bend down and read one of the signs then just to stand silently for a moment and regard the poppies, alone with their own thoughts — as individual as the poppies themselves. Click the images to enlarge them. 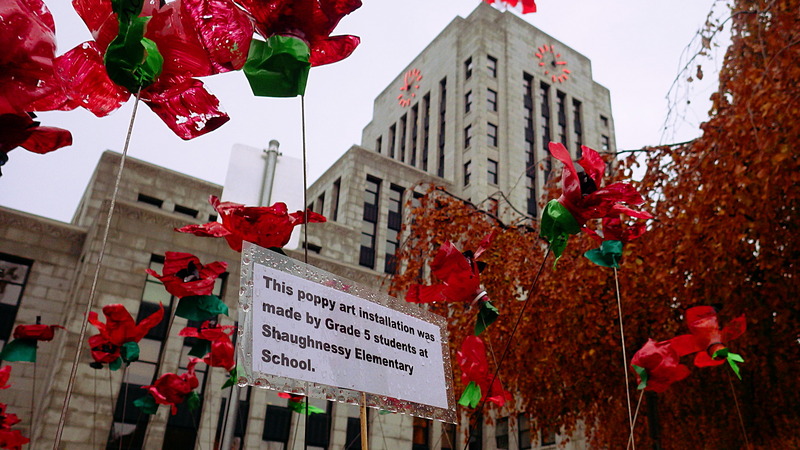 Thank you, Stanely for acknowledging the poppies my students made in our Remembrance Day art installation. We hoped that they would have an impact on those walking or driving by. 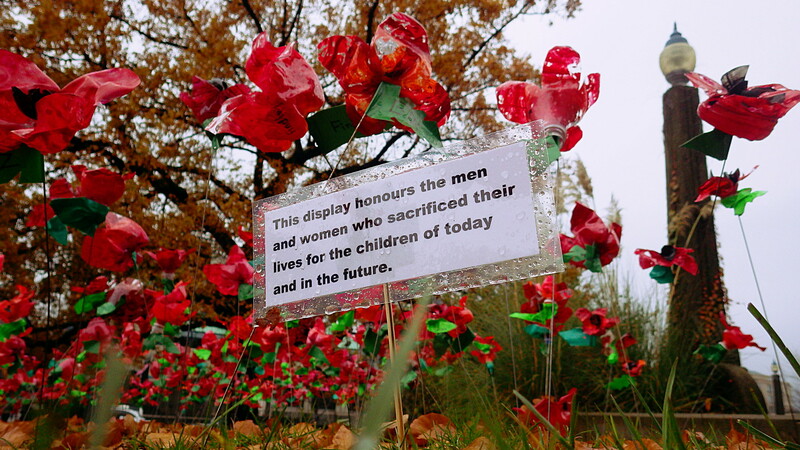 The students wanted me to make the little signs but I agree, the poppies spoke for themselves. By the way, they were made out of pop bottles. 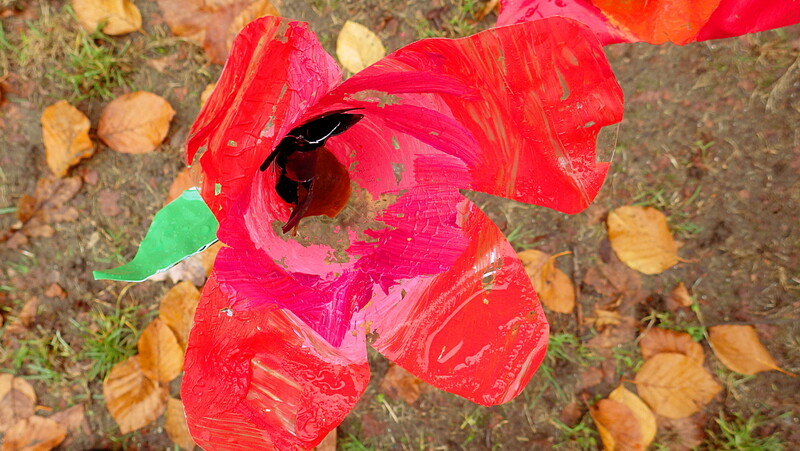 The process was really rewarding as the students had to work together to assemble each painted poppy. I had shown the students the Tower of London art installation last year where 888,000 clay poppies were stuck in the grounds of the moat. If you have a chance to see it, it is totally inspiring. That is where the idea for the installation came from. I was glad that my students embraced the lesson and the inspiration. Thanks again for your interest and article. Thank you for the clarification about how the poppies were made. I was content to look but not touch. I hope you were able to recover them all. And yes, I have seen photos of the Tower of London installation — very powerful. 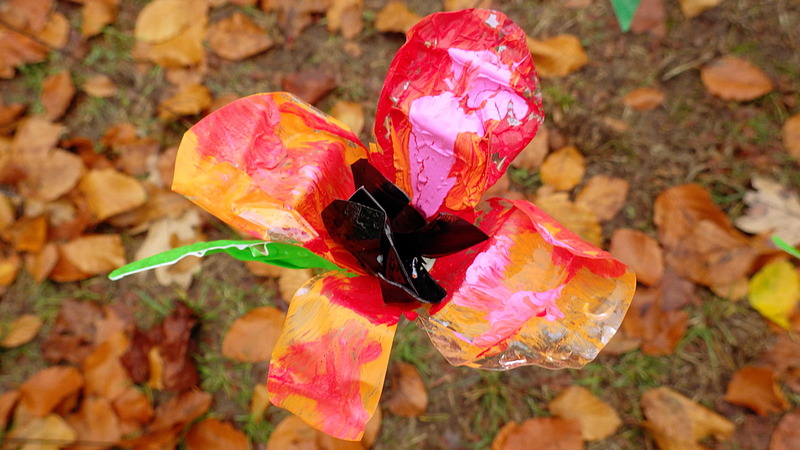 But the individuality of your student’s poppies was also very moving.